I hope the pink t-shirt doesn't throw you too badly for a loop. It was just that I happened to have the engraving under the scope when I was ready to take pics, rather than the black background you usually see! 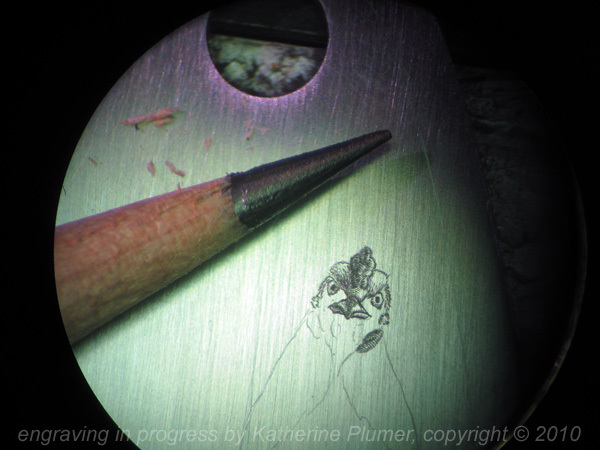 Yes, I'm trying my hand (uh, literally) at engraving again. I'm a tad jealous that a bunch of my friends are soon going to be in Kansas for the two-week Grand Master engraving class learning Italian bulino engraving, so it's inspiring me to try it again. I definitely don't have the comfort level with this that I do with scrim! This is on steel. Pencil lead is shown for scale. The pic is taken through the microscope, so you're seeing what I see when I work. The cowboy scrim is your usual great work. I was wondering how you were going to fill the space on the right. Beautiful!!! You need no apologies for the work on metal. It's already as good as much of what I see on the forums ans elsewhere. That's one fine chicken coming along. I like the drawing on the metal. 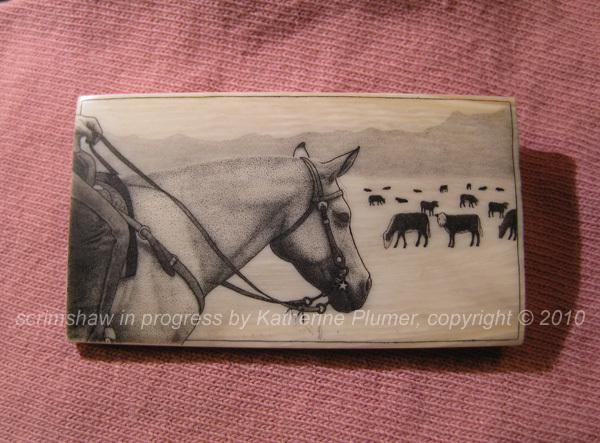 Is it done in pencil and then you go in with the engraver to make lines or dots? -BMc. Well shoot, I was expecting those big swashy design things and what I see is another chicken staring at me. I should have known you wouldn't be engraving doodahs. BMc- one of these days I'll manage to educate you all as to the proper terminology. ;-) The image is first "scribed" (scratched) onto the metal. There are other ways too, but I scribed it. No pencil, it's just sitting there for scale, because it was within reach. The "graver" (tool) is used to make lines or dots. In this case, all lines, though remember a very short line isn't much more than a dot! Jan- yeah, no scrolls for me. Maybe some day. I am going about this engraving thing somewhat backwards. People will usually start with scrolls, and many will insist that people learn scrolls first. After frittering around and getting totally hung up and roadblocked, I reached the conclusion that if I HAVE TO learn scrolls first, it's not going to happen. I WANT to do figurative work in this style, so I need to pursue that first. Right now I really don't want to engrave scrolls, I'm not sure what's up with that but it's a major hangup right now, so I'll just skip that for now. Maybe they'll come along later. Maybe they won't?